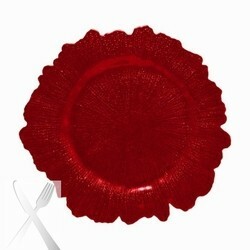 Ten Strawberry Street Red Reef Glass Charger Plate 13-1/4"
Home > Products > Ten Strawberry Street Red Reef Glass Charger Plate 13-1/4"
Provide a sophisticated and vibrant backdrop for your upscale dinnerware with the Ten Strawberry Street Red Reef Glass Charger Plate 13-1/4". Featuring a textured reef design, this charming piece adds a timeless touch to formal dining and upscale events. Thanks to its vibrant red finish, this product coordinates well with a variety of dinnerware collections. Made from high quality glass, this charger boasts superior craftsmanship that combines a delicate look with exceptional strength. A versatile accessory, you can also place a linen napkin on top of this charger plate to use it as a tray for small appetizers or desserts. For proper cleaning and maintenance, hand washing is recommended.